Sudoku and speed enthusiasts, rejoice: now you can have both in one game! Andy Wise’s new iPhone game, Numbl, is a fun math workout that involves addition…with a timer. Just tap enough the numbers on the tiles to add up to the number at the top of the screen. Each tile used correctly will disappear; your goal is to clear the entire screen. You can compare your scores on the world-wide leaderboard, post them on Facebook or Twitter, or (my personal favorite) play against a friend in the 2-player version of the game. Each of you will face off by taking the opposite side and playing Numbl as fast and accurately as you can. One wouldn’t expect a game of basic addition to be so engaging, but with the addition of a timer, Numbl fast becomes an addiction as you try to defeat yourself or others. The fantastically designed layout is just a cherry on top of a delicious cake. It’s fun, it’s a workout for the brain (and trust me, those simple arithmetic skills do atrophy once you’re out of grade school), and it’s only $1.99 for endless hours of both. 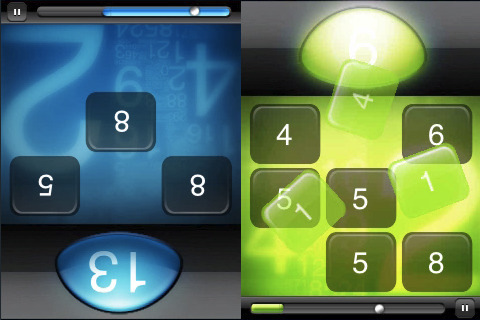 AppSafari review of Numbl was written by Julie Guan on March 13th, 2010 and categorized under App Store, Education, Featured, Fun, Games, Puzzler. Page viewed 4726 times, 2 so far today. Need help on using these apps? Please read the Help Page. I love this game. I play it a lot, but I don’t feel guilty because it requires actual brain power. A must buy; it never gets old.